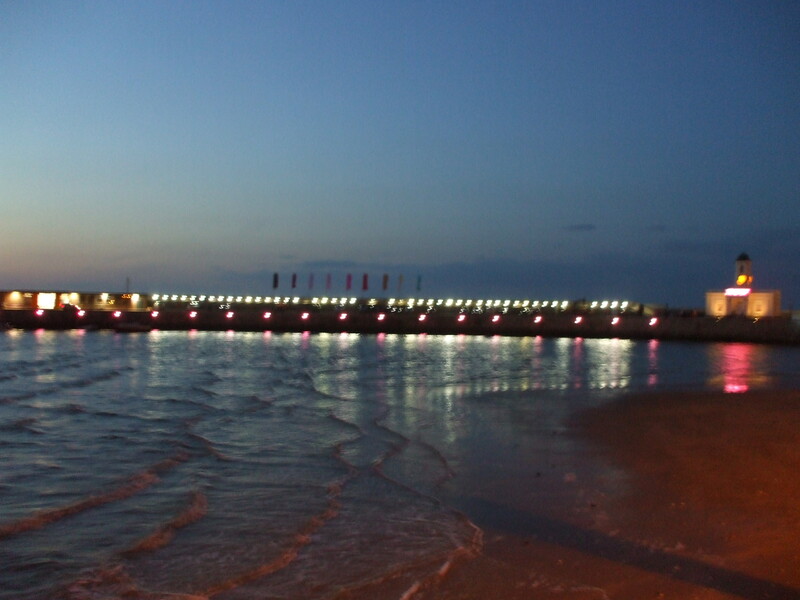 You may have noticed that everyone in Margate is busting a gut to try to make the place look pretty. A tough call, admittedly, but the TDC bods have been out half-steam cleaning the pavements and putting up banners (which got trashed last night – oops, did nobody tell them it’s a bit windy here?). How many years’ warning have we had that Turner is opening – a few I think? Yet, the beautiful TDC/ERDF project which lights up the harbour (sorry the pic is a bit shabby but my camera battery ran out) now looks neglected and gappy. A bit of a summary of Margate, maybe? We are good at gaps, after all. Tonight was the first of four preview nights for 500 visitors-a-time to see Turner. These 2,000 people are probably the most important opportunity Margate has had to date to show that it can deliver a world-class performance. For the sake of a few light bulbs, it has clearly failed. What a shame that, when everyone else is trying their best (Union Jacks out in Westbrook, bunting up in Margate Old Town and flags up on the stone pier) TDC can’t get their act together to deliver a few light bulbs. This lack of attention to detail speaks volumes and unfortunately reflects negatively on the many people in Margate who are putting their hearts and souls into making it such a great place. Probably the reason the clean up didn’t start sooner was that no-one knew it was happening – it hasn’t been on the TDC website.